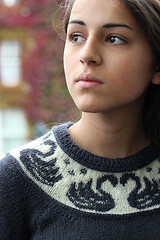 Wetwang is knitted in the round from the top down, with short rows below the colourwork to scoop the front neck. The scoop is increasingly more exaggerated through the sizes. The yoke is circular until after the colourwork, when it switches to a simultaneous set-in sleeve construction. The pictured sample was made with Wensleydale DK from the Wensleydale Longwool Sheep Shop. This is a light dk, equivalent to a US sportweight. Suggested needle sizes are 3.25mm/US 3 and 3.5mm/US US 4. Tension/gauge is 22 stitches and 32 rows per 10cm/4″ in stocking stitch/stockinette. The pattern is written for 14 sizes, from 32-58 inch chests, and includes guidance on adjusting length in body and sleeves for a custom fit. A full schematic is provided showing metric and imperial measurements.